Mark and Lisa (Genco) Shelton are two talented, and generous performers, both graduates of North Country Union High School in Newport. They have donated thousands of hours to benefit worthy causes. 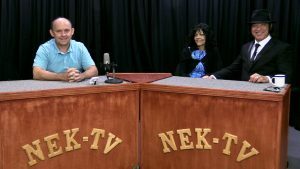 Next week Mark and Lisa will appear on the Northeast Kingdom Voice television show to talk about a fundraising concert scheduled for October 1 at the Haskell Opera House in Derby Line. 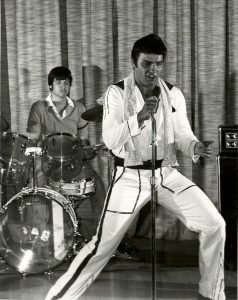 During the concert, Mark will appear as Elvis Presley. Accompanying Mark and Lisa will be a band full of some of New England’s best performers. There are two shows – at 2 p.m. and 7 p.m.
One of the most versatile singers to ever come out of the Northeast Kingdom, Mark Shelton began his music career performing Elvis on the stage as a high school student at North Country in the 1970s (note photo of Mark as Elvis in high school with Jeff Sequin on the drums). Since then, he has performed all over the United States and points around the world. Lisa, who is equally talented, is the daughter of the Rev. John and Ruth Genco. She literally grew-up absorbed in the world of music. This fundraising concert hits even closer to home for the couple. All proceeds will go toward Lisa’s ongoing battle with stage 4 lung cancer. She has been fighting the disease for 27 months. In preparation for this energized production, Mark lost more than 155 pounds through diet and exercise. And leading up to the concert, to provide a more authentic Elvis look, he shaved off the beard he has had since 1983. Please come and support a couple who have given so much to so many people. The Northeast Kingdom Voice, which is hosted by Scott Wheeler, the publisher of Vermont Northland Journal, airs every week on NEK-TV in Orleans County on Channel 17 on Monday at 6 p.m. and Wednesday at 7:30 p.m.. The show will also be posted on Vermont’s Northland Journal website at www.northlandjournal.com later in the week.